No MSG added. No preservatives. In 1924 Caesar Cardini created the Caesar Salad and now you can too. Just break lettuce into 2"lengths. 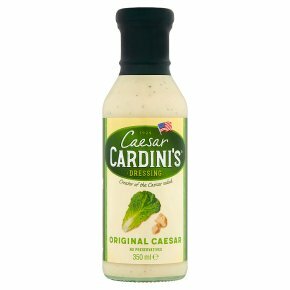 Add Cardini's Original Caesar Dressing. Squeeze lemon over salad to bring out flavours. Sprinkle with parmesan cheese and pepper. Toss. Add croutons. Toss lightly and serve immediately. Shake well.